When the North Korean People’s Army (NKPA) crossed the border on June 25, 1950, its large, well-trained army steamrolled through the unprepared ROK forces, starting the Korean War. Believing that remaining neutral would be interpreted as weakness by the Soviets, President Harry Truman won the support of the United Nations (UN) for the defense of South Korea, assigning the military response to General Douglas MacArthur, commander of the American occupation forces in Japan. American reinforcements were sent piecemeal, so the NKPA had gained control of all of Korea except for a small perimeter around the port of Pusan by August. The NKPA had already burned itself out with repeated frontal attacks when an amphibious landing at Inchon caught the North Koreans completely by surprise. Seoul was recaptured on September 25, and the NKPA began to disintegrate. Deciding to reunify Korea by force, an overconfident MacArthur dismissed China’s warning that it would not permit American troops near the Yalu River, the border between China and North Korea. The entry of hundreds of thousands of Chinese ‘volunteers’ into Korea in late November transformed the war. 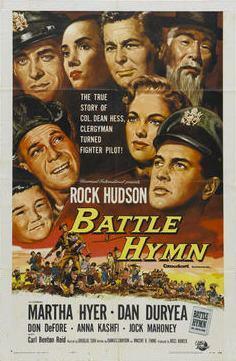 Dean Hess (Rock Hudson), who had become a minister to deal with his guilt after accidentally destroying a German orphanage during WWII, re-enlists as a pilot to train ROK pilots, shortly after the start of the Korean War. Arriving in Korea, Hess quickly shapes up the lax instructors, including Captain Dan Skidmore (Don DeFore), a fellow pilot in WWII. Enemy troops are getting closer and closer, so the pilots are allowed to fly armed. Disregarding Lieutenant Maples’ (James Edwards) objections, Skidmore leads the trainee pilots to shoot up an NKPA truck convoy, but Maples kills refugees by accident. Hoping to help, Hess shares his own experience with Maples, who uses religion to deal with the guilt, unintentionally comforting Hess. 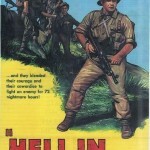 When the airfield is overrun by starving orphans who raid the garbage cans, Hess convinces En Soon Yang (Anna Kashfi), a young woman, and Lun Wa (Philip Ahn), an elderly Christian Korean, to help turn an abandoned temple into an orphanage, using supplies scavenged by Sergeant Herman (Dan Duryea). Some of the officers do not like the idea of a preacher as a CO, fearing he won’t fight if combat starts. An attack on the airfield offers Hess the opportunity to prove them wrong. When the enemy suddenly breaks through and the airfield is abandoned, Hess evacuates the 400 orphans on foot, and it seems that they will be trapped, but his superior had learned of his mission, and has sent five transport planes to save them. Col. Dean Hess, the model for the film, was the technical adviser, but he clearly did not have script approval or did not look carefully at the script, since there are significant differences between him and the screen version. In the film, Hess decided to become a minister to cope with guilt over the accidental bombing of a German orphanage. While the bombing did occur, the real Hess was already an ordained minister before serving during WWII, and he was recalled to duty two years before the start of the Korean War. Most important, although Hess was involved in several charity groups that cared for orphans, he did not actually single-handedly found an orphanage. Admittedly, the evacuation of the orphans to an island off the coast did take place, and was called the Kiddy Car Airlift, but it was a much larger operation that transported 900 orphans and 80 staff from the orphanage. The miraculous nature of the rescue of the orphans at the climax may suit the religious tone of the script, but in reality the actual evacuation was better organized and involved more people. Although the movie was filmed in Arizona, twenty-five of the actual orphans were flown over from Korea to play themselves. Romance develops between En Soon Yang and Hess but he is happily married so nothing happens, and she dies protecting a kid. The romance seems invented, since On Soon Whang, the basis for Kashfi’s character, was fifty-years-old at the time. 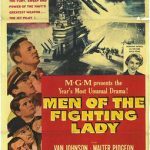 In addition, she was Korean, unlike Kashfi’s character who was described as half-Indian to reflect the actress’ own parentage, and she survived the war. Anna Kashfi is half-Indian and half-Irish, but her character is half-Korean, half-Indian, and born in Dehli. The movie is respectful to the ROK pilots, who are shown as competent and responsible, but Hess’ guilt, not the pilots’ achievements, is the focus of the story. In an interesting twist, it is the black pilot and a Korean who provide the moral advice, not the white pilots. Despite its open-minded attitude, the script does not stray far from traditional 1950s morality. Conveniently, the darker-skinned love interest is killed, sparing the white male from the dilemma of actually choosing between her and his wife. Also, an older white man, Hess’ former deacon, completely disregards Mrs. Hess’ decision to not tell her husband that she is pregnant. Robert Mitchum was originally supposed to play Hess, but the real man refused to be portrayed by an actor who had been jailed for taking drugs. It is a forgettable film, although it does sidestep the morass of saccharine melodrama, and is surprisingly color-blind for the period. 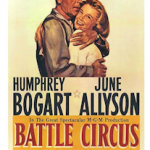 In fact, the movie shows more about Korean culture than other movies on the Korean War.